This ladies hoodie motorcycle jacket fully lined with KEVLAR® fiber ticks all the boxes whether you’re a rider or travelling on the back as pillion. You no longer have to put up with ugly bulky ill shaped broad shouldered sloppy sleeve jackets that weigh & cost a fortune. Free P&H Australia-wide for purchases over $100. Our new KEVLAR® hoodies look nice on and off the bike with its tailored slimming cut in a beautiful 100% cotton fleece zip up hoodie shell. Fully lined with 300gsm knitted KEVLAR® with extra layers of KEVLAR® fixed in shoulders & elbow, removable CE approved armour in the shoulders, elbows and spine. This abrasion & impact resistant jacket is lined with airmax mesh to ensure maximum breathability all season. This light weight jacket is great for short & long trips where you no longer have to lug around a heavy bulky stand out motorcycle jacket. This jacket provides the same looks & convenience on & off the bike with added impact & abrasion resistance. * Removable CE Approved armour shoulders elbows spine. Sizing - Please select your normal tshirt/jacket size. We offer screen printing/embroidery for clubs-groups and discounted rates for larger qauntity orders. 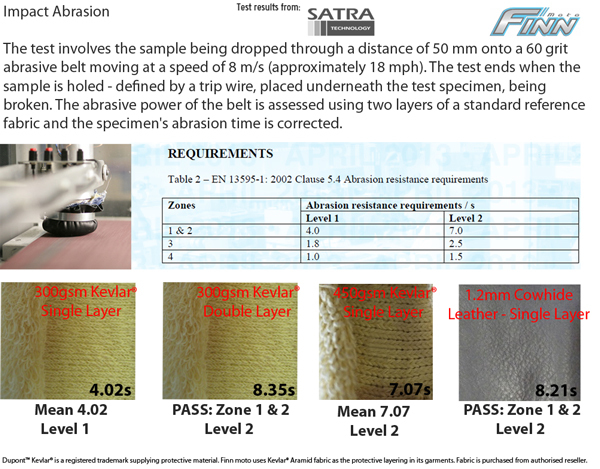 Finnmoto's Dupont™ Kevlar® has been abrasion tested; passing level 2 in impact areas & level 1 in single layer KEVLAR® areas for 13595-1: 2002 5.4 abrasion protection from Satra Technologies UK. This includes 3inch of elastic cuff. Purchased for my Main Squeeze. Same high quality, thick material and excellent fit as my black, blokey one. Same comfort and excellent armour placement. The red one looks a bit pink on the site but it is definitely red. Advice from my wife... buy your exact size.